Fire has the ability to both destroy and cleanse. It’s a force that we, as humans, have an incredibly difficult time trying to control, especially when it’s eating our vulnerable forests alive. There’s also internal fire that can act much in the same way, although it’s not going to decimate anything physical to ash. That said, it also can be enough to drive one to great heights or destructive lows. Black metal force Vanum are issuing their second record “Ageless Fire” on their new label Profound Lore, and it’s a collection that feels like it combines both fiery chaos aiming to decimate worlds and bring about new change, as well as their personal passion that they pour into their music. 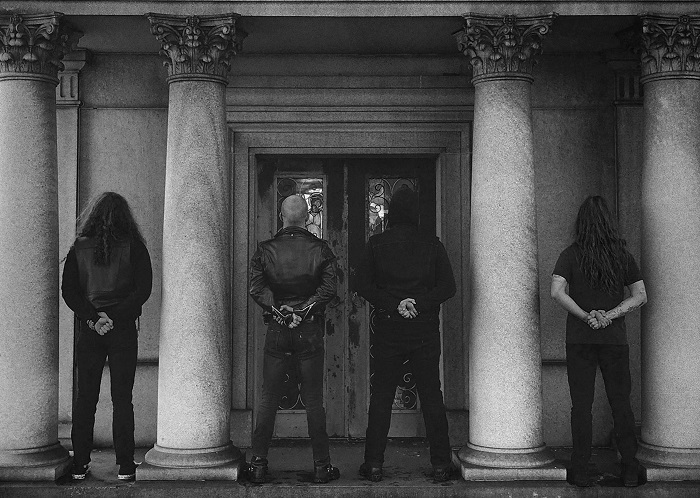 The title also could bring to mind the band’s ability to bridge the infernal roots of black metal with their modern fingerprints all over this music, and the six tracks that blast over 41 minutes could get inside you and set your soul ablaze. The band has expanded from its initial two-member approach as joining K. Morgan (Ash Borer, Predatory Light, Superstition) and M. Rekevics (Yellow Eyes, Vilkacis, Vorde) are E. Priesner and L. Sheppard (also of Predatory and Superstition) who help beef up the sound and make the band a more well-rounded machine. This record is a huge step forward from their great debut album “Realm of Sacrifice” and catapult them further into the realm of some of this era’s more enthralling bands of any style of metal. “War” starts the record, and despite it hinting at complete destruction with its title, it’s really not that. It’s an instrumental piece built with whipping winds, atmospheric pressure, and strong riffs that bring in the heat. The track hangs largely in space, and it fades out into doom bells, leading the way to “Jaws of Rapture” that tears the lid off the record. The guitars light up and begin the assault, as harsh growls strike, melodies barrel into you, and the drums crumble rock into ash. Soloing surges as the guitars punish and lash away, the leads cascade, and the track comes to an end amid the rumbling drums. “Eternity” is the longest cut on the record, a 10:13 beast that starts with an almost punk-style run that makes your blood rush as the leads pick up speed and the gruff shouts leave bruises. Great melodies flood, as the track gets more spacious, and then things calm, with a single guitar line acting as a torch. After a synth haze, the main section of the song returns as wild cries tear flesh, and the back end of the track is consumed by fire. “Under the Banner of Death” rages over 9:02 but first starts in a haze before it splits open for mighty riffs to barrel through. The playing is powerful but also kind of frosty, and gravelly yells jab before an adventurous stretch leads to the track hitting the gas pedal. Passion pours like lava while the murk re-emerges and obscures sight, before the finish hits a full gallop that flattens everything in front of it. The title cut is eerie at first, as a bizarre fog drops before the power keg is activated and blown to bits. Smashing growls scrape at flesh as riffs encircle, making the room spin recklessly. The tempo changes up as the leads feel like they’re running a marathon, leading to a blinding fury. The vocals leave more welts, with the song ending in an icy explosion. “Erebus” is a brief instrumental close that boils in space gasses with the guitars striking up drone and the song coming to an uncomfortably serene finish. 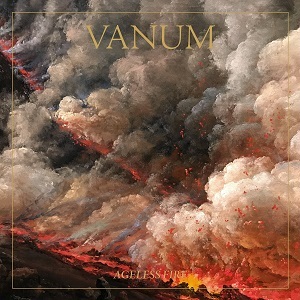 Vanum’s reign in black metal circles might be in its infancy, but with more records as mighty and devastating as “Ageless Fire,” it won’t take them long to be looked at as masters. This album is a fire-breather, a melodic beast that gets inside your bloodstream and begins to slowly change you. By the time you’ve spent several trips with “Ageless Fire,” you’re going to find yourself demanding better of the metal on your record shelves, much of which Vanum make look kind of puny.